Sorry it’s been a bit quiet on the blog but that doesn’t mean there’s been nothing going on – quite the contrary in fact. Here’s a summary of the last week or so. 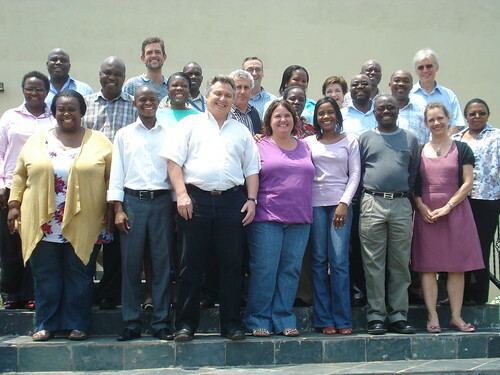 The highlight was the TMSA Retreat in South Africa. As I have explained earlier, TMSA have taken us under their wing and will be funding the ‘regional’* elements of our work over the next two years. They have also provided us with excellent office facilities and associated support. At the retreat, lots of synergies became immediately apparent – over and above the ‘Last Mile’ distribution that got their attention – and I see follow-up sessions on project communications and learning frameworks (which Jane is leading on for ColaLife) and online project management systems. We are using Huddle and they are using Sharepoint . . . While of the subject of Huddle, I’ve been pleased with the way partners have engaged with this – there is just one partner yet to put their tasks on the system – you know who you are :-). Huddle has impressive security but at the same time is refreshingly open which is absolutely crucial when managing a partnership, with organisations using different versions of various bits of software. I’ve put a RSS feed from our Huddle system on our home page (bottom right) so our supporters (that’s you) can get an overview of what we are up to operationally. After the TMSA Retreat (or ‘Advance’ as some people think it should have been called) we spent the weekend with Ian and Judy Goldman. We are great friends and used to be neighbours in Warwickshire and in Mpika. Now we are neighbours in southern Africa! Ian is on the ColaLife virtual advisory board. ColaLife did come up in conversation once or twice (!) but the weekend was mostly spend relaxing and shopping for those things that are still difficult to get hold of in Zambia. The best bit was a visit to the Apartheid Museum which was really well done. Need to go back again to be able to absorb it all. When we got back to the office on Monday ,the prototype packaging had arrived along with PedZinc samples from Shelys Pharmaceuticals in Tanzania. 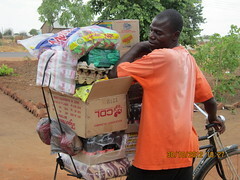 We were really keen to get back to Zambia to see what the designers had come up with. We had seen a preview during a Skype presentation by the team at PI Global at the beginning of the week, before our departure for South Africa. 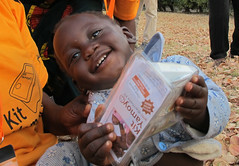 PI Global have taken the AidPod concept to another level – more on this in the next couple of days. 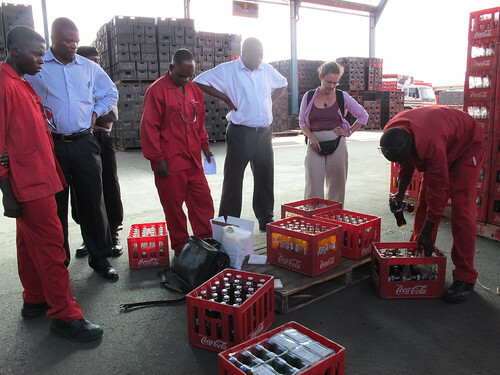 On Monday afternoon SABMiller had assembled all possible combinations of crates and bottles so that we could test the fit of the new packaging. Watch this space for more…. And finally . . . the call for Expressions of Interest (EOI) in Monitoring & Evaluation for our project closed today. We received 10 EOIs and most are of a very high quality – I’m confident that we are going to get the world class M&E partner we need. * For the benefit of our supporters in the UK, in Africa ‘regional’ means several countries (eg Southern Africa) not a part of one country.